Brook MacDonald riding the new Trek Session 650b. Photo courtesy of Trek Bicycle. One of the superpowers of downhill racing, Trek Bicycles revealed today that they are now testing the capabilities of the 27.5 wheel size for World Cup Downhill. This has been the domain of the proven 26er wheel size but many have been wondering if the new 27.5 size would encroach on this territory as well. 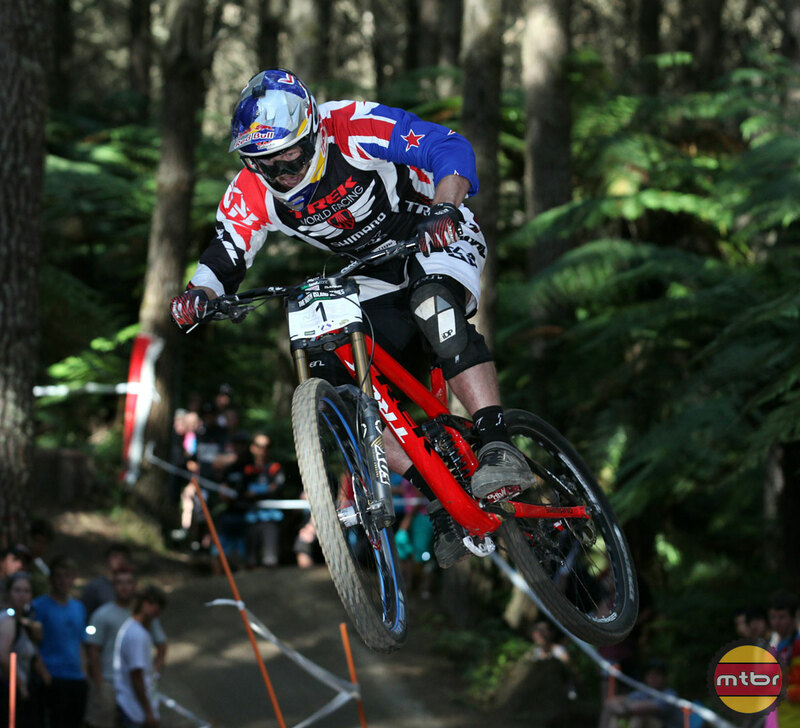 Trek is not the first for downhill 27.5, as we’ve seen KHS with their downhill bike ridden by Logan Binggeli here. Trek’s entry though, is significant since they have the budget, the racers and the R&D to truly validate this wheel size. 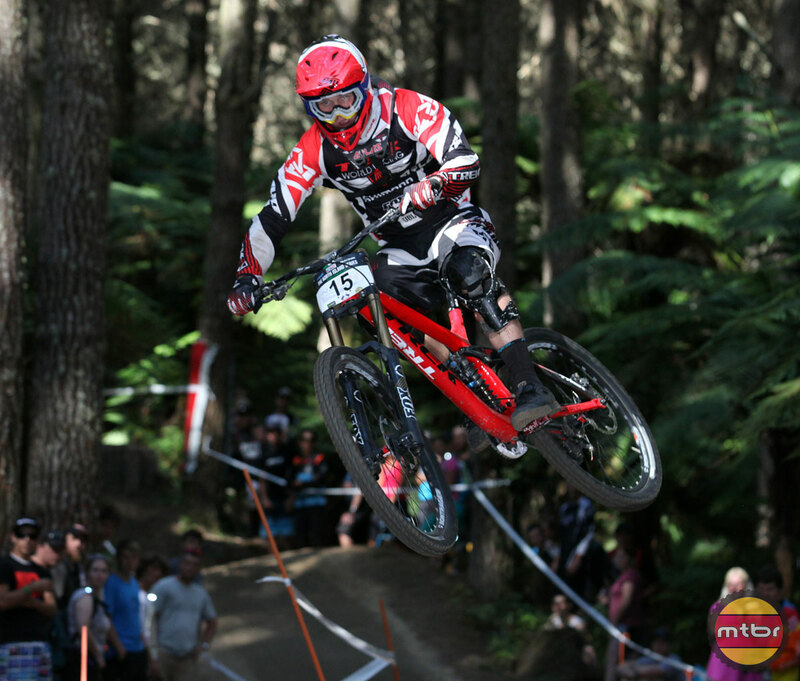 They have competitive racers like Brook MacDonald that can win at the World Cup level. They have relationships with vendors like Fox to spec and create suspension for this wheel size. They also have the wheel and tire wizardry required to create components that can win at the World Cup level. Often with a new wheel size, tires can be the difference between winning and losing, so Trek is fortunate to have Bontrager Components, which can create the same tire on all wheel sizes. Thus, the scientists at Trek Labs can analyze results objectively and determine if there is an advantage on a specific wheel size. From the photos, it looks like Trek has already created the awesome Bontrager G5 tire in this new wheel size. If Trek wins on with the 27.5 wheel, there will be a tidal wave of interest in creating downhill bikes in this size. We at Mtbr predict that Trek will use both wheel sizes throughout the season and pick the appropriate tool when either agility of the 26er or the bump/rut eating ability of the 27.5 is advantageous. Brook MacDonald’s Session 650b bike sports new Bontrager tires and RAD suspension from Fox. Trek’s World Cup downhill team, Trek World Racing, will start the season aboard a new 650b prototype version of the team-issue Session 9.9. The team is evaluating the merits of 650b wheels in World Cup downhill racing. In five quick years of competing at the World Cup level with Trek World Racing, the current Session has been ridden to 30+ podium finishes, three World Cup Overall Titles, and a World Championship; an unprecedented run for a single bike platform. With George Brannigan’s (NZL) run to the New Zealand National Championship aboard the 650b proto this past weekend, testing has gotten off to a fast start. Previously, Trek World Racing, along with the overwhelming majority of downhill pros have raced almost exclusively on 26” wheel downhill bikes. 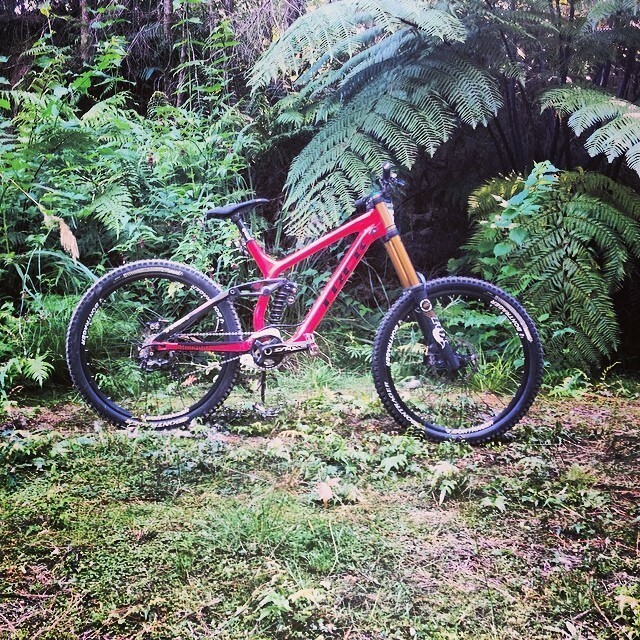 World Cup Downhill Racer Brook Macdonald posted a photo of his new bike on his Instagram account. Through two highly popular new product offerings over the past year, along with a significant research effort, Trek has become a leader in 650b wheel development. In 2013, the brand unveiled two new 650b wheel platforms in the technical trail category with the Remedy and Slash. “Our hope is that the new 650b Session will provide a performance advantage to our riders and continue to keep them on the podium,” continued Riley. “We also know that these athletes will test the extreme limits of the bike and provide us with invaluable feedback as we continuously evaluate and refine the Session.” The full line of Sessions will continue to be available including the Race Shop Limited Session Park, a model with shorter chainstays and reduced travel perfect for gravity park riding. Trek encourages riders to watch as the bike evolves throughout the season. The team will begin testing the prototype at this weekend’s New Zealand National Championships. Not surprising. 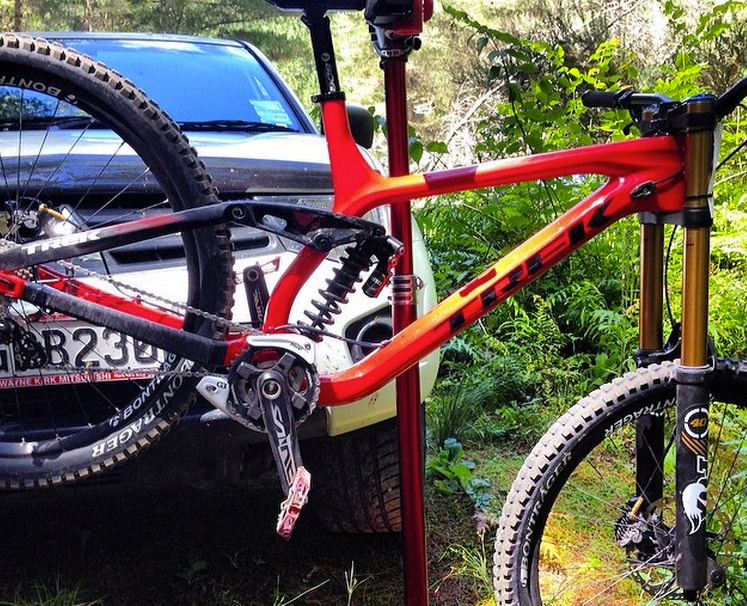 Pivot Cycles has been prototyping their 27.5 DH rig for nearly a year. This is a DH Bike, why this arcticle even posted here, cause it’s 27.5? Does anyone here knows anyhthing about DH?